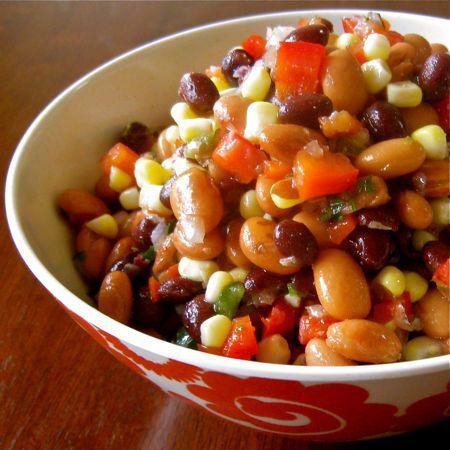 As promised, here’s the recipe for Southwestern Two-Bean Salad that completes my grilling menu from the other weekend. I chose this salad to go with the Cilantro Honey-Lime Grilled Chicken and the Hill Country Coleslaw because it’s hearty, generally crowd-pleasing, and it contained the one ingredient that tied all three dishes together: cilantro. Its fresh summer flavor would make it right at home on just about any picnic or barbecue buffet, though; I’ve served it with pulled pork sandwiches and burgers as well. 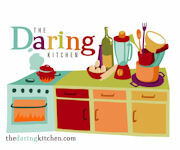 For the dressing, whisk together vinegar, oil, sugar, cumin, oregano, salt and black pepper in a small bowl. Set aside. For the salad, drain and rinse beans. Place beans in a large bowl. Drain corn. Chop bell pepper and add corn and bell pepper to beans. Chop onion and jalapeno peppers. Snip cilantro using kitchen shears (or chop it). Add onion, jalapeno peppers, cilantro, and dressing to bean mixture. Mix gently. Cover and refrigerate 2 – 3 hours to allow flavors to blend. I just love this salad. It’s light and fresh, and I like the way the tender texture of the beans contrasts with the crunch of the peppers and the corn. Plus, it’s inexpensive to make, it keeps wonderfully, and it adapts well for a variety of menus. Give it a try! TIPS: Since it’s summer and fresh corn is readily available, I substituted fresh corn for the canned. I cut the kernels off of two cobs, placed the corn in a colander, poured boiling water over it, and drained it before adding it to the salad. Also, since my mom recently fell victim to “jalapeno eyes,” a note about working with jalapenos: After handling jalapenos, always (!) make sure you wash your hands (or wear gloves). If you have jalapeno oil on your hands and you touch your skin (or heaven forbid, your eyes), it will burn. I accidentally touched the corner of my mouth recently with jalapeno hands, and while it wasn’t excruciating, I could definitely feel the heat. If you’re generally cautious about spicy food, though, don’t let this scare you out of using jalapenos in the salad. Removing the seeds and membranes tones them down considerably. I’m a bit of a wimp when it comes to spicy food, and I could barely taste them. My family always washes with bleach after handling cut jalapeños.